A "hot Saturn" passes in front of its host star in this illustration. 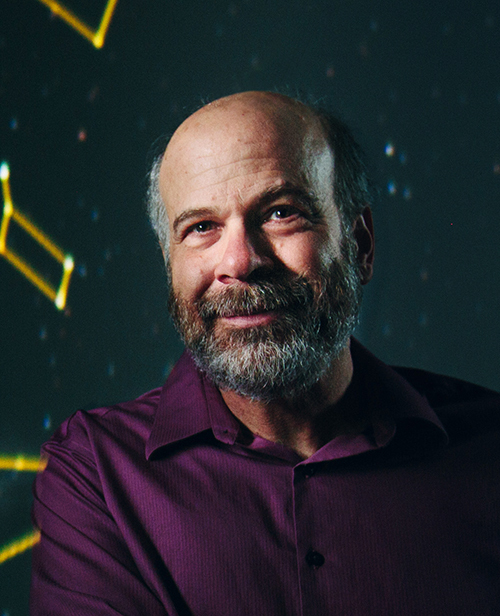 Astronomers who study stars used "starquakes" to characterize the star, which provided critical information about the planet. 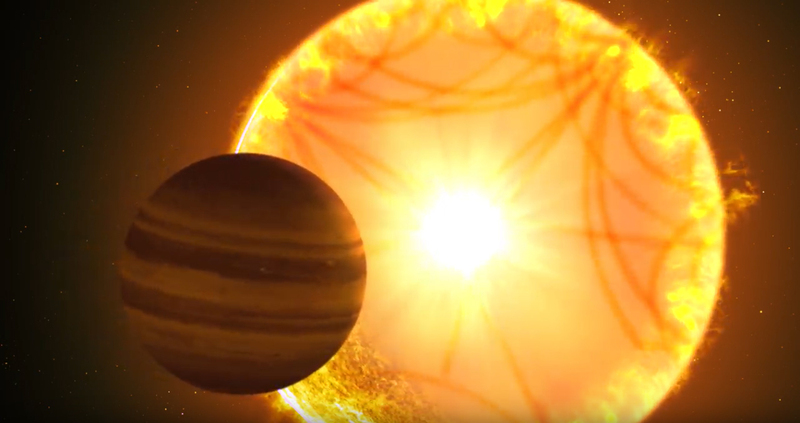 See a video illustration of the planet orbiting the star. Larger image. Illustration by Gabriel Perez Diaz, Instituto de Astrofísica de Canarias. AMES, Iowa – Astronomers who study stars are providing a valuable assist to the planet-hunting astronomers pursuing the primary objective of NASA’s new TESS Mission. In fact, asteroseismologists – stellar astronomers who study seismic waves (or “starquakes”) in stars that appear as changes in brightness – often provide critical information for finding the properties of newly discovered planets. This teamwork enabled the discovery and characterization of the first planet identified by TESS for which the oscillations of its host star can be measured. The planet – TOI 197.01 (TOI is short for “TESS Object of Interest”) – is described as a “hot Saturn” in a recently accepted scientific paper. That’s because the planet is about the same size as Saturn and is also very close to its star, completing an orbit in just 14 days, and therefore very hot. The Astronomical Journal will publish the paper written by an international team of 141 astronomers. Daniel Huber, an assistant astronomer at the University of Hawaii at Manoa’s Institute for Astronomy, is the lead author of the paper. Steve Kawaler, a professor of physics and astronomy; and Miles Lucas, an undergraduate student, are co-authors from Iowa State University. “This is the first bucketful of water from the firehose of data we’re getting from TESS,” Kawaler said. TESS – the Transiting Exoplanet Survey Satellite, led by astrophysicists from the Massachusetts Institute of Technology – launched from Florida’s Cape Canaveral Air Force Station on April 18, 2018. The spacecraft’s primary mission is to find exoplanets, planets beyond our solar system. The spacecraft’s four cameras are taking nearly month-long looks at 26 vertical strips of the sky – first over the southern hemisphere and then over the northern. After two years, TESS will have scanned 85 percent of the sky. Astronomers (and their computers) sort through the images, looking for transits, the tiny dips in a star’s light caused by an orbiting planet passing in front of it. NASA’s Kepler Mission – a predecessor to TESS – looked for planets in the same way, but scanned a narrow slice of the Milky Way galaxy and focused on distant stars. TESS is targeting bright, nearby stars, allowing astronomers to follow up on its discoveries using other space and ground observations to further study and characterize stars and planets. In another paper recently published online by The Astrophysical Journal Supplement Series, astronomers from the TESS Asteroseismic Science Consortium (TASC) identified a target list of sun-like oscillating stars (many that are similar to our future sun) to be studied using TESS data – a list featuring 25,000 stars. Kawaler – who witnessed the launch of Kepler in 2009, and was in Florida for the launch of TESS (but a last-minute delay meant he had to miss liftoff to return to Ames to teach) – is on the seven-member TASC Board. The group is led by Jørgen Christensen-Dalsgaard of Aarhus University in Denmark. TASC astronomers use asteroseismic modeling to determine a host star’s radius, mass and age. That data can be combined with other observations and measurements to determine the properties of orbiting planets. In the case of host star TOI-197, the asteroseismolgists used its oscillations to determine it’s about 5 billion years old and is a little heavier and larger than the sun. They also determined that planet TOI-197.01 is a gas planet with a radius about nine times the Earth’s, making it roughly the size of Saturn. It’s also 1/13th the density of Earth and about 60 times the mass of Earth. Those findings say a lot about the TESS work ahead: “TOI-197 provides a first glimpse at the strong potential of TESS to characterize exoplanets using asteroseismology,” the astronomers wrote in their paper. Kawaler is expecting that the flood of data coming from TESS will also contain some scientific surprises. Iowa State's Steve Kawaler, a professor, and Miles Lucas, an undergraduate, contributed to the analysis of a planet discovered by NASA's new TESS Mission. It's the first planet identified by TESS for which the oscillations -- "starquakes" -- of the planet's host star could be measured. A scientific paper by an international team of astronomers will report the discovery in The Astronomical Journal.